It’s happened to all of us: That unintentional slip on a wet floor, or a trip over a cord from a lamp. 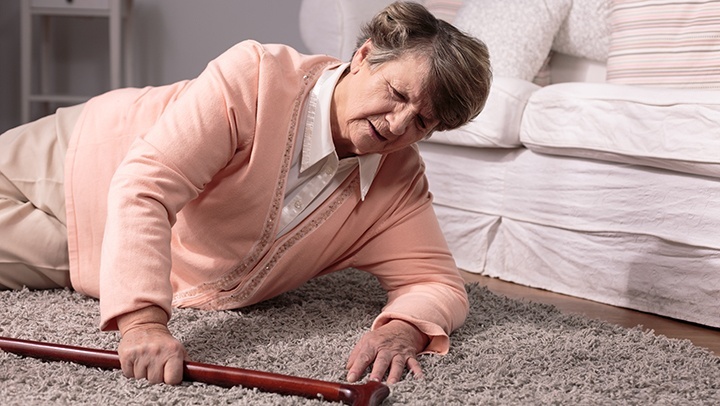 Slips, trips, and falls make up the majority of accidents in the age group 65 and over. In general, falling usually occurs due to a loss of traction between the shoe and walking surface or an inadvertent contact with a fixed object that leads to a fall. Many situations may cause slips, trips, and falls. Some of which are wet and greasy floors, uneven walking surfaces, damaged or irregular steps with no handrails, clutter, protruding electrical cords and cables, and sloped walking surfaces. Walking surfaces account for the highest portion of injuries from falls reported by hospitals and state agencies. The most frequent reported areas where these injuries occur include hallways and dining areas, showers, bathrooms, and floors in general. Reduce wet or slippery surfaces by immediately cleaning the spill up and not waiting for someone else to do it. If you are in a residential community, cones are available to mark the area that is wet. Use anti-skid shoes at all times. Shoelaces need to be tied correctly. Avoid creating obstacles in aisles and walkways. Injuries result from clutter and equipment in aisles, corridors, and stairwells. Use proper lighting in bathrooms, staircases, ramps, hallways, and dining areas Individual attention is critical in the prevention of slips, trips, and falls. Walking at a steady pace without being in a hurry will prevent the chances of falling. Taking short cuts, not paying attention by using a cell phone or carrying materials that obstruct vision are common fundamentals of falls. Aging is often linked to visual and auditory issues and imbalances resulting in a high risk for falls. It is imperative that caregivers be proactive in fall prevention since it could save someone’s life. By being positive and practical slips, trips, and falls can be prevented.